Juneau Sen. Dennis Egan said he expects that the $3.5 billion budget deficit will dominate the agenda during this legislative session. But will anything be accomplished to fill that gap? That’s a different story. 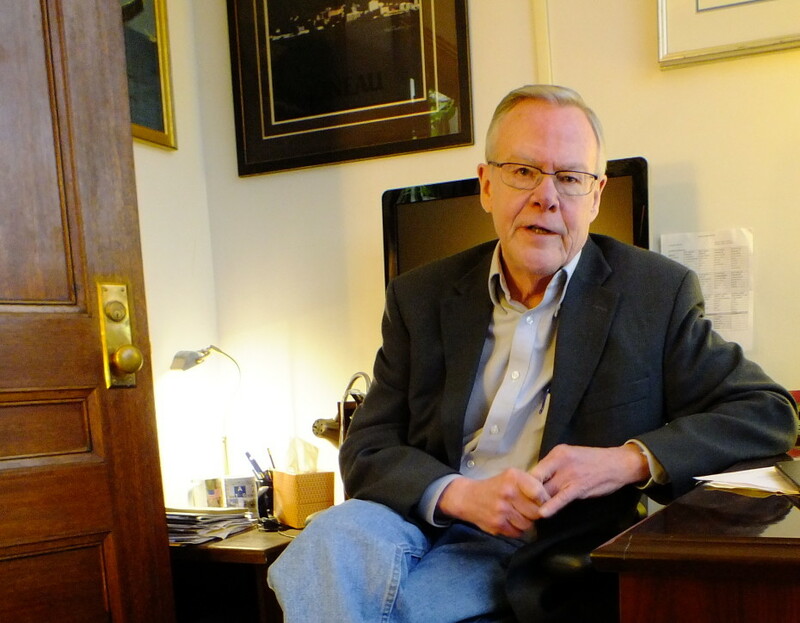 Egan expects election-year politics will paralyze most lawmakers, and he said some will be in a big hurry to campaign in their home districts when April adjournment approaches. “I just hope that we don’t kick the can too far down the road,” Egan said. Egan thinks Gov. Bill Walker’s latest budget proposal is a good starting point with the combination of borrowing, restructuring the Alaska Permanent Fund and imposing new taxes. But he said some elements should’ve been rolled out earlier to get the discussion going sooner. Egan favors an income tax over a statewide sales tax since many municipalities generate their own revenue from sales taxes. “So, the best way to do it that I can think of is to raise some sort of an income tax again,” Egan said. The state repealed an old income tax in 1980 as the Alaska Permanent Fund was established. Earlier this month, Walker announced a formal hiring freeze to reduce the size of state government, although many departments already had an informal freeze on hiring new employees when he took office in December 2014. Egan is concerned that the hiring freeze will hurt Juneau without putting much of a dent in the deficit. Egan worries that education will be targeted for deep budget cuts this session. The Alaska Marine Highway System has already been hurt by last year’s cuts. Sitka, in particular, has had their service severely curtailed for this summer. The latest version of this summer’s schedule appears to restore part of that service. But Egan is not very optimistic. Egan complained that other lawmakers — especially those in the Railbelt — just don’t understand what the ferry system is designed to do and why it is so important to coastal communities. As was the case last year, Egan’s top legislative priority for this session involves giving public employees a choice of pensions. New employees are currently limited to a defined contribution retirement system that is flexible and portable from one employer to another. The legislation would restore a defined benefit pension that could share the risk of rising health care costs and guarantee a monthly benefit. Egan believes his bill will pick up steam this year. He said the big hook is the potential savings of $70 million over the next 10 years. The Juneau Democrat, who is a member of the five-member minority in the Senate, hopes for a return someday to a version of the old bipartisan working group. He said its members were able to put partisan differences aside and get things done by working together. Egan’s Senate District Q seat includes Juneau, Douglas, Gustavus, Haines and Skagway. The second regular session of the 29th Alaska Legislature is scheduled to adjourn April 17.